Trailhead is on Ravine Lodge Road in Woodstock, NH (summit is in Benton). Ravine Lodge Road leaves the west side of Rt. 118 7.2 miles southwest of Rt. 112. The trailhead is 1.6 miles up the road. Park on the side of the road. Its gentle alpine summit offering unique views from the far western side of the White Mountains, Mt. Moosilauke is a favorite mountain of many White Mountain hikers. Its location and huge mass and make it easily identifiable from anywhere it is visible. There are many trails that ascend Moosilauke, including two that are part of the Appalachian Trail. There are difficult routes up the mountain, such as the treacherous (but incredibly scenic) Beaver Brook Trail, but there are also many easy ways. The long but tame Gorge Brook Trail is probably the easiest choice. Any steep sections on the way up are avoided by switchbacks. While it is not the most beautiful path on the mountain, it is the best choice for hikers who are new to mountains of this size. Gorge Brook Trail begins at the Dartmouth Outing Club's Ravine Lodge. From the trailhead, walk down a staircase and follow the trail as it descends past a few buildings and huts to a long bridge over the Baker River. Cross the bridge and turn left at a former trail junction (the trail to the right has been closed). Continue a short distance and turn right as a spur to a swimming hole continues straight. The trail then climbs away from the river, joining a smaller brook. Quickly fork right to stay on Gorge Brook Trail as Hurricane Trail bears left. The trail climbs steadily alongside the brook. In 0.3 miles, it crosses on a bridge and leads to another former trail junction (where Gorge Brook Trail once turned right; now it has been relocated further up due to storm damage). The trail leads uphill and away from the stream to the new junction. Turn right to stay on the trail as Snapper Trail continues straight. After leading high above the stream for half a mile, the new trail section descends to meet the original route and cross a bridge over the brook again. It follows the brook on the other side for 0.3 miles to a plaque marking Ross McKenney Forest. Here, it turns away and gets a little steeper, and after a half mile of climbing, reaches a cleared viewpoint to the south. The trail eventually reaches the top of a ridge and turns left to follow it up. It continues ascending through an open forest. Soon, the grade steepens and the trail begins to switchback uphill. After about a mile of climbing since the first outlook, the trail becomes rockier and views begin to open. Switchbacks continue as the trees get shorter and views get better. You will soon reach the summit of Moosilauke's East Peak, where there are wonderful views south. The trail descends slightly into the forest before re-emerging into the alpine zone. A short climb in the open takes you to the rocky summit of Mt. Moosilauke. The view from the summit is spectacular. To the west, you can see the long ridgeline of the Green Mountains in the distance. The small Benton Range is seen nearby below. 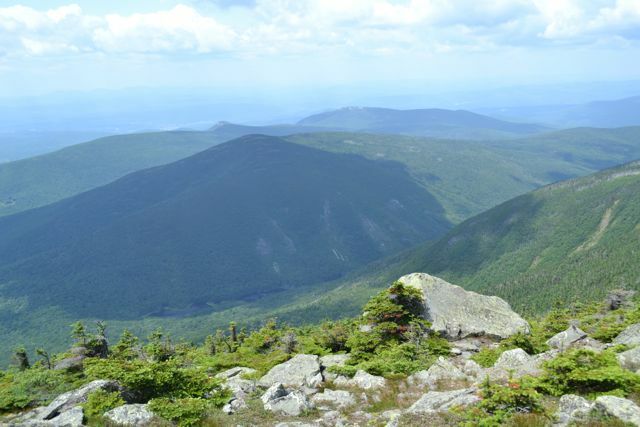 To the southwest is Moosilauke's South Peak, which you will visit on the way down. To the south, the view extends a great distance to the south, above the Carr-Kineo Range. To the east are the mountains around Waterville Valley and the Sandwich Range. To the left of these are Mts. Carrigain and Hancock. To the northeast is the Kinsman Range, with the Franconia Range behind it and the Presidential Range behind that. To begin your descent, follow Moosilauke Carriage Road. This trail leaves the summit just to the west of the way you came up, opposite the Beaver Brook Trail. The Carriage Road soon drops below treeline and leads across the mostly flat ridge to Moosilauke's South Peak. In 0.9 miles from the summit, reach a junction with Glencliff Trail. For a short and worthwhile detour, turn right onto this trail, then immediately left onto a spur trail to South Peak. The summit is reached in a steep 0.2-miles. From the South Peak, there is a good view back at Moosilauke. You can also see straight down to Tunnel Brook Notch, which you couldn't see from the summit. After visiting South Peak, return the way you came and continue down the rocky Carriage Road past a boulder barricade (placed to prevent snowmobiles from reaching the summit). Descend for another mile at moderate grades with occasional views, then turn left onto Snapper Trail. After an uneventful 1.1-mile descent through the forest, you will reach the junction with Gorge Brook Trail, where you can return the way you came.